It seems the occupant has stepped away from this white bench with a pink flowered shawl draped over one end. The price is for this alone. 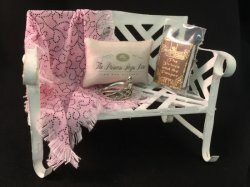 The pillow ($12 each), book ($2.50 each), and crown are available elsewhere on this website, enabling you to personalize your garden bench.